Microsoft has released a free Windows 10 update for all current Windows 7 and Windows 8.1 users and some of you may be wondering if all your applications are compatible with this new release. 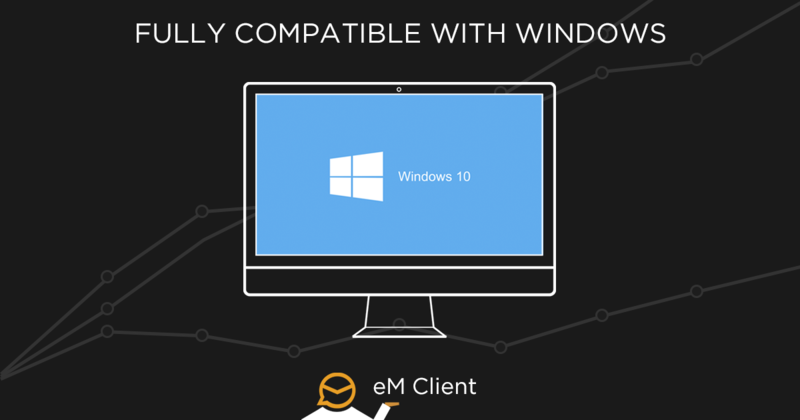 eM Client as a native Windows 10 application is fully compatible with Windows 10 and all currently supported Windows releases. We’re also working hard on the upcoming release of eM Client 7 and its features will improve the overall experience and compatibility with Windows devices. We promise to release more information soon, but you can already look forward to major features like conversation view, delayed send, new user interface and many more with this new release. If you come across any issues with eM Client running on Windows 10, make sure to let us know on the Community Support or our VIP support if you're a PRO license user.